Eastern sophomore Olivia Barber (12) spikes the ball, during the Lady Eagles’ win on Tuesday in Racine, Ohio. 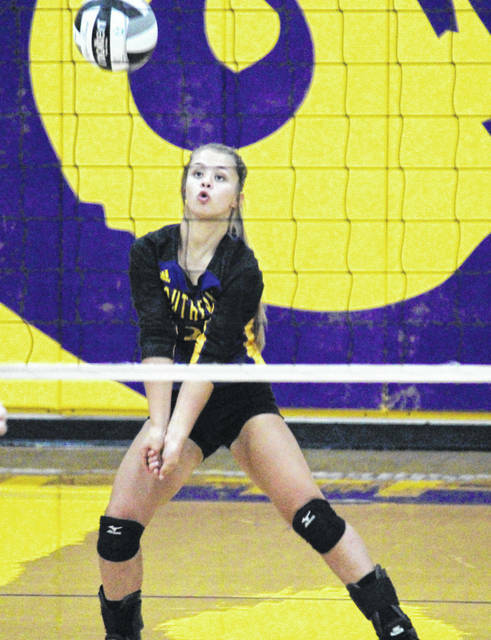 Southern senior Peyton Anderson receives a serve, during the Lady Tornadoes’ setback on Tuesday in Racine, Ohio. RACINE, Ohio — A rivalry match that lived up to the hype. 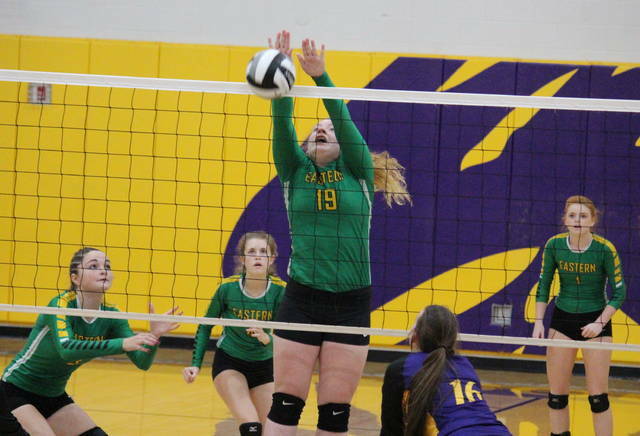 The Eastern and Southern volleyball teams battled through five games on Tuesday night in Meigs County, with the visiting Lady Eagles prevailing in the deciding game to earn the season sweep of the Lady Tornadoes. Southern (2-11, 2-8 TVC Hocking) took the lead to open play, battled through a single tie at 1-1, and led the remainder of the first game. 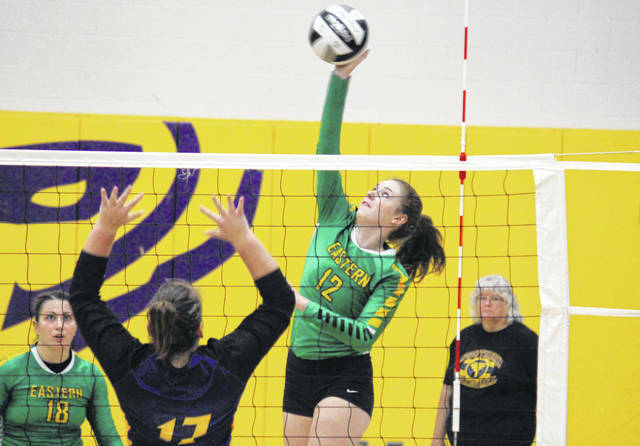 The SHS lead grew as high as nine, at 18-9, and the Lady Tornadoes cruised to a 25-19 win in the opener. Eastern (8-3, 7-2) took its first lead of the night at 3-2 in the second game. The Purple and Gold tied the game at three, and again at six, but never regained the advantage. The Lady Eagles evened the match with a 25-13 victory, which they finished with an 8-0 run. The guests carried the momentum into the third, scoring the first five points of the game. Southern cut its deficit to three points, at 5-2 and again at 8-5, but never got closer, as Eastern moved ahead 2-1 in the match with a 25-10 win. The Purple and Gold scored the first three points of the fourth game and led wire-to-wire. Eastern trailed by as many as nine points, at 16-7, but battled back to within three, at 17-14. SHS answered with a 7-1 run to get into a game-point situation, which Eastern fought off four times before the hosts finally forced a fifth game with a 25-19 win. Eastern scored the first two points and never trailed in the deciding game. Southern tied the game at six, nine and 10, but the Lady Eagles went on a 5-1 run to take the match-sealing 15-11 victory. Following the triumph, first-year Eastern head coach Mykala Sheppard talked about her team’s battle to match the Lady Tornadoes’ intensity. For the Lady Tornadoes, third-year head coach Kim Hupp acknowledged the up-and-down night her team went through. Both teams finished with a 94.1 serve percentage, with the Lady Eagles earning 13 aces and the Lady Tornadoes picking up nine. Eastern had a 48.2 side-out percentage, while Southern earned a 39.2 side-out percentage. Sheppard acknowledged one area her team must improve on is the mental aspect of the game. Hupp noted that her team has worked through some of the early season issues, and that the Lady Tornadoes are ready to finish the year strongly. Kelsey Casto led the EHS service attack with 20 points, including five aces. Jenna Chadwell and Caterina Miecchi each had 14 points, with Miecchi earning a match-high six aces. Alexus Metheney had nine points and one ace for the victors, Haley Burton came up with four points and an ace, while Kylie Gheen ended with one service point. Sydney Adams paced the hosts with 12 points, including five aces. Marissa Brooker was next with nine points and three aces, followed by Baylee Wolfe with seven points and one ace. Baylee Grueser contributed six points to the Lady Tornado cause, while Peyton Anderson and Phoenix Cleland chipped in with five points apiece. At the net, Miecchi had a match-best 14 kills to go with a team-high three blocks. Allison Barber and Layna Catlett both recorded five kills and two blocks, Gheen and Olivia Barber added three kills apiece, while Chadwell earned one kill. Allison Barber led the EHS defense with 15 of the team’s 53 digs. 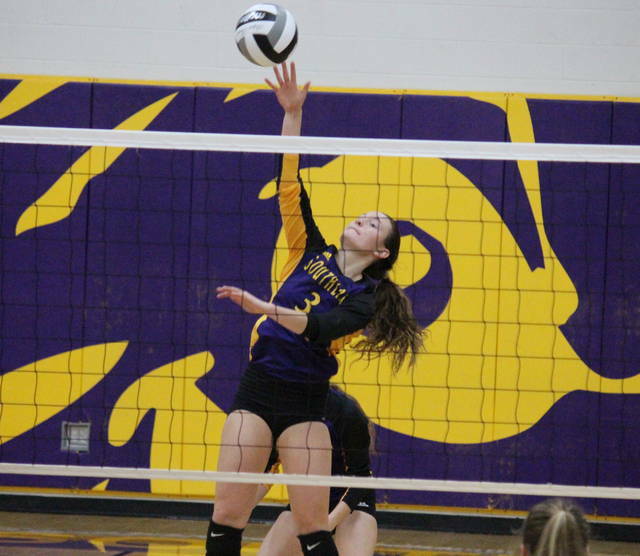 Wolfe led the Lady Tornadoes at the net with nine kills and six blocks. Jordan Hardwick had six kills for the hosts, Brooker added three, while Adams, Cleland, Mickenzie Ferrell and Saelym Larsen each had one kill, with Cleland earning a block. The Lady Eagles also defeated Southern on Aug. 29 at ‘The Nest’ in straight games. Both teams continue league play on Thursday, with Southern visiting Waterford, and Eastern visiting Federal Hocking.